My hope is that my young children will find friends in the saints as I did growing up. This is why I am so glad to have found the CTS Children’s Book series on saints for kids. Padre Pio has always been one of my favorite saints and so I was automatically drawn to his story first. I find his life fascinating and after watching a movie about his life, I have attempted to learn more about him. His life was miraculous and this book shares his story so that younger children can learn about him. The book begins with telling us about Padre Pio’s childhood and continues through his answering his vocation. It shares his difficult fight with illness, his gift of the stigmata, and finishes with the legacy he left behind. What I appreciate most about this biography for children, is that it chooses the most important parts of his life to share with young children and is written in a way that will appeal to them. Each page is colored in beautifully illustrated pictures that make the pages so fun to look at and will easily hold the interest of younger readers. Sometimes I feel it is difficult to find good quality Catholic saint books, but this one was excellent. I think this book is perfect to celebrate All Saint’s Day (which is approaching quickly at the date of this publication) and the feast of St. Padre Pio on September 23rd. In fact, any of the books from the CTS Saints for kids series would be perfect to help learn more about saints! 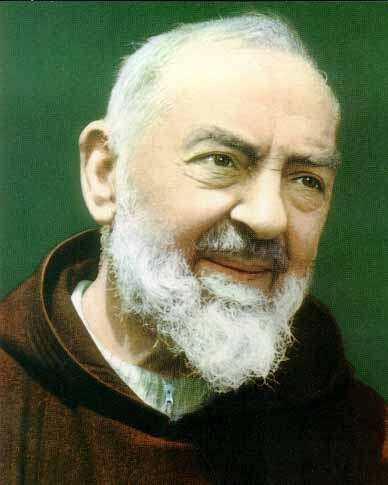 Saint Padre Pio’s Feast Day is on September 23rd. Check out these great ideas from Catholic Icing to help celebrate with your kids. Pray the prayer of Saint Padre Pio (found at the end of the book) together as a family. Find some coloring pages of Padre Pio online and color together as a family. Padre Pio felt Confession was a very important sacrament. Talk about this sacrament as a family. If the child is old enough, go to confession together. Celebrate All Saints Day by doing some of these great crafts from Catholic Icing together as a family. Be sure to read some of the other saint books in the series!